What is Enhance Mind IQ? Enhance Mind IQ is a nootropic dietary supplement that enhances brain performances and energy. With this particular supplement, you can experience improved mental focus and an enhanced memory regardless of age or gender. This supplement is non-bias and works for all classes of people including students, professional athletes as well as fitness gurus. It works to deliver cognitive precision with reference to optimum mental performance. How Does Enhance Mind IQ Work? Enhance Mind IQ Ingredients – Are they Safe & Effective? What are the Advantages of Enhance Mind IQ? What are the Disadvantages of Enhance Mind IQ? 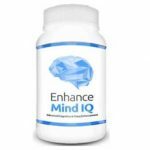 What Kind of Reviews are Out there for Enhance Mind IQ? The neurons in the brain are where all the fundamental brain activities and processes take place; they send and receive information that throughout the body by use of acetylcholine chemical known as neurotransmitters. This cognitive supplement works to enhance memory and fixation by synchronizing the structural disposition and composition of the acetylcholine levels in the brain. It makes the cerebrum alert and attentive thus enabling one to stay sharp and focused. It also boosts serotonin levels thus improving focus and attention. The recommended dosage for this supplement is one pill every day in the morning hours. It is also imperative to take the pill alongside a meal so as to avoid a stomach upset. Phosphatidylserine Complex – This formula works to promote healthy brain activity by nourishing the brain cells for an improved overall cognitive function. Betaine – Important for the neurodevelopment and functioning of the brain. Vitamin B complex – They consist of the like of Riboflavin, pantothenic acid and thiamin that are fundamental in boosting cellular energy and production. Bacopa Monnieri – Bacopa helps to improve memory and reduce anxiety. It might boost mood and enhance a faster brain processing ability. This supplement may deliver reliable results owing to its clinically tested ingredients. It could alleviate tension and anxiety by boosting mood to create a calming effect. It might lead to improved vitality. It can lead to stomach upsets especially if ingested on an empty stomach. It is also not suitable for expectant or lactating women. The ingredient list for this product is not comprehensive enough. How Should You Take Enhance Mind IQ? The manufacturer website does not mention any dosage instruction. However, you can get the usage direction after reading the product label. How Much is Enhance Mind IQ? The product is available on 14-day free trial. All you have to do is pay $4.95 shipping and handling charges to claim your bottle. What is Enhance Mind IQ Return Policy? The product comes with a 100% money back guarantee. In case, you are not satisfied with the product, you can return the bottle and issue for a full refund. Does Enhance Mind IQ Offer a Free Trial? Yes. The product is available for 14-days trial period. Enhanced Mind IQ is a natural nootropic element that comes in capsule form and does not feature any side effects subject to the blend of its natural ingredients that have been clinically proven to be safe on the body. The product can be ordered online through its web portal. Enhance Mind IQ is a nootropic supplement that in simple terms do four basic functions; improve brain focus, facilitates mental sharpness, improve cognitive function and increase energy levels. If you are struggling with concentration issues, lack of focus and memory loss, then this is your ultimate solution. Besides the above benefits, it also boosts mood and energy levels in the body. When considering the purchase of this supplement however it is important to do extensive research on a personal level to ascertain its complete ingredient list as well as pricing methods since the manufacturer has given a little information that relates to those aspects.